​Clay Tile and Metal Roofs by Hialeah Roof Repair are as Green as Green can get. Did you know that Clay Roof Tiles and Metal roofing materials are made with 95% recycled materials ? Clay and Metal are truly green earth materials. How much more green can you get? The benefits of a Clay Tile or Metal roof go further than their "Green" appeal. Clay Roof Tiles and of course Metal Roof Material are reflective, Ventilated and can last upwards of 75 -100 years in some cases. Some manufacturers offer 75 year warranties. Not to mention the Tax credits that may apply because the material choice can extend the life of your roof adding value to the expenditure. The "barrel" shape of a clay tile, lends them to being great for allowing Hot air to escape in the summer and their natural weight can help to insulate the home in the winter. It's a Win-Win all the way around with Clay Tile Roofing. Also, a clay tile roof adds, curb appeal, All in all a tile roof keeps you safe from the elements and saves you on heating and cooling costs with it's energy efficiency. Using a "Cool Metal Roof" solution is a smart choice. The ability of the material's sun reflectivity and it's highly emissive quality can decrease your building's cooling bills by a whopping 40%! These benefits not only save you money but are Fantastic for the environment! 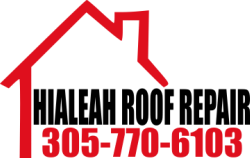 These environmentally friendly roofing material choices are a top rated, customer best pick in South Florida and all over the country. Ask your Hialeah Roof Representative how you can go green with your next roof repair or roof replacement. It could be the best roofing decision you ever made for your Home investment.